This kite is aimed at beginners who want to make their first experiences with trick and artistic flights. Even with little wind, the Salsa II flies calmly and elegantly. 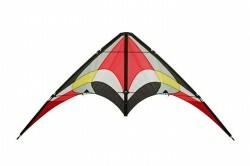 Due to its easy handling, even beginners quickly learn to fly their first trick figures. Circle precision is also admirable for a kite of this category. Start your dance with the Salsa! If you're going on vacation, this kite can be collapsed to a size which fits your suitcase and packed in a space-saving size. Height: 91 cm / 36"